I’m experiencing a bit of writer’s block. I have a folder full of recipes and photos to share . . . but I can’t think of anything to say other than: they are all delicious. And of course they are delicious or I wouldn’t share them with you. The problem is that the more recipes and photos I pile up here and the more I tell myself I need to get writing, the harder it seems to get down to it. Surely there is an end in sight though? The past week of writer’s block will surely translate to a very prolific week of words now? Well, we’ll see. I also keep being distracted by the thought of the patisserie in Paris. I think I need to find a ‘how to’ patisserie course. Perhaps it is because my next spice is not really doing anything for me. Caraway has a pungent anise-like flavour and aroma, which is one group of tastes and smell I don’t get on with. Probably how it gets its alternaltive name of meridian fennel or Persian cumin. The seeds are actually fruits and are a member of the carrot family (thank you wikipedia). It is used extensively in Indian rice dishes and European rye breads, plus British seedy cake. The dish I came across in which I actually mildly liked its flavour was sauerkraut that I had a couple of years ago in Berlin. 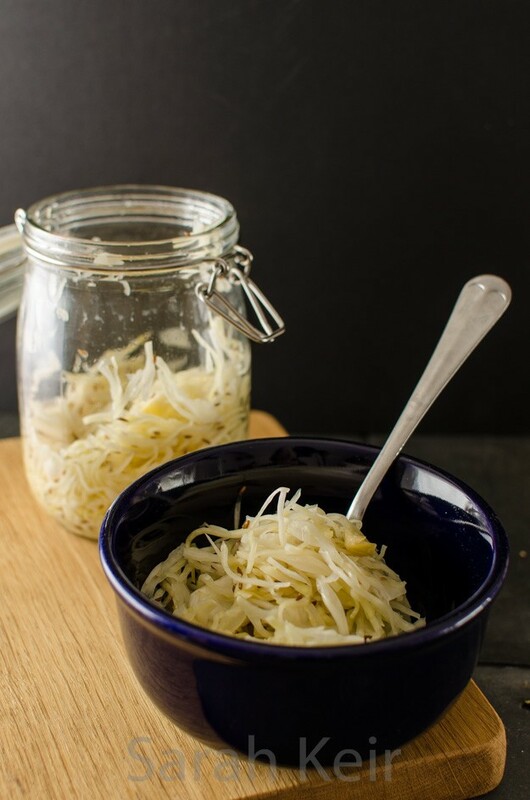 The recipes for making sauerkraut did not look hard, and indeed it was not difficult to make. The sharp-sour taste works well with pork and fish dishes. This recipe is from The Kitchn, altered by adding a tablespoon of caraway seeds mixed with the cabbage. You can also try adding juniper berried too; lightly crush them first. You need a large, or couple of, jars with wide necks. Probably the type you buy sauerkraut in from the supermarket. I used a couple of these jars from Ikea (they are like kilner jars) and they worked great too. The trick is making sure there is enough liquid to submerge the cabbage and to keep the cabbage submerged while it is fermenting. 1. Clean everything. You want good bacteria to ferment your cabbage so sterilise everything with boiling water. 2. Prepare the cabbage. Remove the outer leaves, cut into quarters and remove the woody core. Then finely shred the cabbage and place in a bowl. I found my mandoline slicer invaluable for this step. 3. Salt the cabbage. Sprinkle the salt over the cabbage in the bowl. Clean your hands and then massage the salt into the cabbage. You need to do this for 5-10 minutes until juice starts to flow from the cabbage. Mix in the caraway seeds. 4. Pack the cabbage into the jars/s. Tamp down the cabbage to remove as much air as possible. Add any juice that collected in the massaging stage. You need to weight the cabbage down. The easiest way I found was to use one of the discarded outer cabbage leaves on top of the salted cabbage and place a full jam jar on top of this. 5. Cover the jar but do not seal – a clean tea towel does fine. Leave out on the work top for several days, pushing down on the cabbage whenever you can. If the cabbage is not submerged in liquid by 24 hours then add some salt water (1 teaspoon in 250ml of water) to cover. 6. 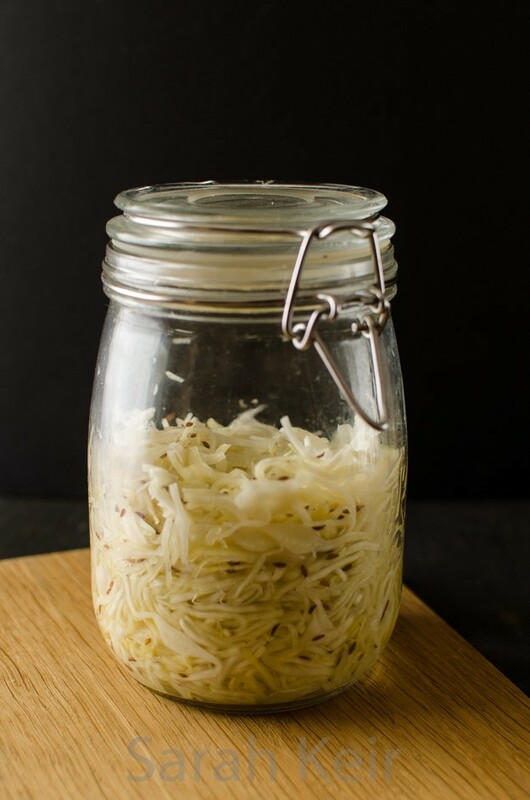 Ferment the cabbage for 3-10 days at cool room temperature. The work top in my kitchen worked fine and meant I could keep an eye on the kraut. Start tasting it after 3 days and when it reaches your ideal of sourness then transfer to the fridge and seal the top to stop further fermentation. It will keep for a couple of months in the fridge.